George Bowman is in the Arizona Blues Hall of Fame and rightfully so. He traces his Blues roots all the way back to Edwards, Mississippi, the place of his birth and continues today to carry on in the traditions he grew up with. 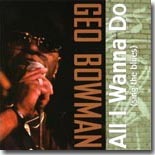 His self-produced CD, All I Wanna Do (Sing the Blues), is a keeper and I�m glad I have a copy to call my own. George surrounded himself with some of Phoenix�s finest players: guitarists Scotty Spenner, Paul Robinson, Kenny Brown; David Bedell on drums; Lawrence Ross on keyboards; Mike Black on bass and Chris Skowron who contributed his tenor sax and the other horn parts found on this disc. The result is a disc that takes me back to the days of the classic singers I love --- James Carr and Bobby �Blue� Bland --- to name a couple. Let�s throw this disc in and hear all that George has to offer up for our listening pleasure. All of the tunes on the disc are Bowman originals, and we open up with �You With My Wife.� George comes home from work, ready to crash and finds his good friend, sleeping with his wife. �When I walked through the door, saw clothes on the floor, I knew something was wrong�.saw my friend�and my wife�getting it on, I presume.� His friend, of course, blames George�s wife and lost all resolve when she took off her clothes. Needless to say, George is crushed and not sure where to go from here. David�s backbeat kicks in and we move on to our next cut, �Better Not Be Lyin� To Me.� George is an old-fashioned man and he�s going to hold this one to her words. �You told me�that you love me�and your heart�belongs to me�.well, I�m gonna�.hold you to it�cause, that�s the way I do it�you�d better not be lyin� to me.� George wasn�t necessarily looking for love but since it�s crossed his path he�s going to walk down that road and she�d better be good to him. Things don�t always work out that well, though and George covers this topic in our next track, �Feel Sorry for the Next Man.� �I�m sick and tired�of your cheating ways�.I�ve gone through hell with you baby�for days and days�woman, I don�t understand�and I sure feel sorry for the next man.� At least Georges realizes this one isn�t worth keeping and he�s ready to move on from her. Lawrence�s keyboards and Chris�s sax provide the introduction to �So Many Ways,� the first ballad on the disc. Again, the topic here is love and the fragility of it all. �I wish I could find�a love that�s true�that�s a love, baby�.that I had for you�all these lonely nights�.and these blue, blue days�love comes and goes, yes, it does�in so many ways.� A beautiful ballad and definitely one of my highlights on this disc. We move back up-tempo as George tells us all about the �Trouble in My House.� �I got trouble in my house�bad things going down�.going down for sure.� George can�t seem to please the woman in his life and if he can�t figure it out, she�s bound to leave him with the wandering eye she seems to have. Good luck with this one George. Our next tune, �All I Wanna Do,� has a classic Memphis soul feel to it and I�m really appreciating the talents of all the players involved. George is working a 9 to 5 here and dreams of the day he can put that job behind him. �Want to sing in the bars and clubs all over town�all I wanna do is sing the blues�and lay it down�you know it makes me feel so good�I love the blues and its understood�cause I sing the blues and that�s all I wanna do.� There�s some beautiful fretwork in this tune and I can�t get enough of it. George�s passion for his music is clearly evident and he continues to share that with us in �Man With A Dream.� �I�ve had the blues�for so many years�and I�ve cried�so many tears�when I hear the blues on the radio�I don�t know which way to turn�or which way to go�but it�s my dream�to make the blues scene.� In our next cut, �Ain�t Got No Money Honey�, George is forced to disclose to his woman that he doesn�t have a dime to his name. �You know the money I had�when I met you baby�it was borrowed, yes, it was.� George�s deception caught up to him with this one but at least he�s man enough to tell her the truth. What happens next is anybody�s guess. Chris is blowing a mean sax solo that is probably George�s version of an apology to this high maintenance woman of his. We move on to �Three O�clock in the Morning� and I�m again reminded of some classic times back in the day at the Old Bombay Bicycle Club in Scottsdale. It�s late at night and George�s woman is just finding her way through the door. �I ain�t even going to talk to you about it now, baby�I don�t even wanna know�where the hell have you been.� Out that late on her own, it�s not a wonder George is not happy with his wife. While she�s obviously in the wrong, she�s not repentant for her bad behavior either and George is going to have to decide where the future of this relationship is going to go. Lawrence Ross also put together the arrangements for all of George�s tunes and he�s back at the keys for our final cut, �Merry Christmas to You.� �Merry Christmas baby, you sure have treated me right�and all the Christmas presents I got for you, baby�Santa Claus will cling to you tonight.� I�m guessing there�s some fine lingerie and other assorted goodies in the presents that George will help her open on Christmas night. Mikey Junior�s new disc, Traveling South, was another item that made its way into my CD player on the road to Memphis and helped me pass some time away. As I write this, Mikey and his wife Katie are celebrating the birth of their first son, Michael Grayson, and my congratulations go out to the proud parents. Back in the day there was a time when it seemed like Mikey Junior was ubiquitous, everywhere you turned in Memphis there he was, hustling his music during the IBC, and I remember a scintillating set he did at the Heritage Music Blues Festival that my good friend Bruce Wheeler put on. Dave Gross produced Mikey�s new disc and it�s a good one, so let�s give it a listen. Mikey Junior�s got a great band behind him and I�m hearing some upright bass from Matt Raymond in my ears as Mikey tells us, �Nobody Does It Like Me.� Mikey�s got the magic and his woman is definitely having a tough time escaping the grip he�s got on her heart. �So you came back�like I knew you would�you said you�d stay away�if you only could�your heart is hooked�and it ain�t hard to see�nobody�does it like me.� That�s the Mikey Junior I know, supremely confident and sure of himself. Michael Bram�s drumming sets the tone for our next tune, �Morning on My Way,� and Mikey is finding out the woman he loves isn�t true. �You�re a mean mistreater�you don�t mean me no good.� Mikey Junior�s harp is wailing and he�s well on his way to setting this woman free. The tempo slows down a bit on our next tune, �Mill Tavern,� and Jeremy Baum�s piano is at the forefront. Mikey Junior�s woman is out of town and he�s having a tough time behaving on his own. �It�s getting dark again�the day turning into night�my mind won�t settle down�I�m wondering�who�s she with tonight�I see that sun going down�I ain�t got nobody�you know my baby�s not around.� Mikey�s struggling with his demons and it isn�t a pretty sight to see. �Katie Lynn� I�m sure is written for Mikey�s wife and his love for her obvious. �Katie Lynn�when can I see you again�if it ain�t tomorrow�let me know just where and when.� There�s a strong bass line in my earphones and Mikey Junior has just the right hint of desperation is his harmonica playing to do �Katie Lynn� justice. I�m guessing it's Dave Gross�s guitar providing the intro to our next cut, �Bad Time Blues,� and Mikey Junior is lamenting the loss of the love in his life. �One minute you�re up�the next you�re down�everyone on my block�see�s me hanging around�it ain�t hard to tell�I�ve been drinking�I got the bad time blues.� Another man stole his woman and all Mikey Junior can do is drink his pain away. Up next is �The Cheat� and Mikey Junior has this woman�s act down pat. �Well now�the first time I caught you cheating�I walked in and saw with my own eyes�deny til I die must be your motto�because I slipped and fell between your thighs�you�re just as evil as any woman can be�now look what you have done.� There�s no denying she�s got a hold on Mikey Junior, but I�m sure he�ll see the light of day soon enough. Bad luck with women is the continued theme of the day and Mikey Junior confronts another bad woman in �You.� �All I can say baby�is baby, goodbye.� Mikey Junior knew all she wanted to do was cut his heart out and he�s smart to move on from her as soon as possible. I particularly like the line, �She�s good at being bad�the best girlfriend I never had,� in Mikey�s next tune, �She�s Good at Being Bad.� Sometimes the fire burns bright, you get just enough taste of the flame to get burned and you�re smart enough to walk away. That�s not always the case, but Mikey Junior managed to do so this time. The disc closes with �Trying to Do the Best I Can,� and Mikey Junior is in competition for the affections of the woman he desires. �Well, I got me a woman�she got herself another man�she don�t love me�I�m trying to do the best I can.� Good luck with this one Mikey Junior, but it�s pretty clear this one ain�t happening. Traveling South is an impressive disc from Mikey Junior and he�s come a long way since those early days at the IBC in Memphis. Dave Gross coaxed a great record out of him for Vizztone and I�m sure with the arrival of Michael Grayson, Mikey Junior is a man on a mission. This is a very polished disc and I�m sure Mikey Junior�s live performances reflect his growth as well. 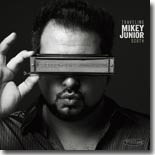 His website is www.mikeyjunior.com and that�s the best place to grab a copy of his new disc. With his East Coast schedule this summer, he won�t be hard to find out that way. So go see him and enjoy. Mikey Junior has always been a great showman and he�s definitely one of the hardest working performers I know. Bob Corritore has assembled an all-star cast of players to play behind him on his new record, Taboo, for Delta Groove Records. It�s a testament to the friendships Bob�s developed over the years to have folks like Junior Watson, Jimmie Vaughn, Papa John DeFrancesco, and so many more play with him on an all instrumental disc. Kudos to Bob for his arrangements that serve to highlight the players as well as his harmonica so well. I�m still not sure how I�m going to be able to convey the feeling of this record but I�m about to try. Let�s hit play and get to it. The first cut up is �Potato Stomp� and I�m hearing Junior Watson�s guitar in the mix as Bob conveys a slight tone of desperation with his harp. Doug James kicks in with his saxophone and with Fred Kaplan on piano as well, the mix for this tune is very relaxed and enjoyable. �Many a Devil�s Night� has a more somber feel to it as Junior�s guitar and Fred�s Kaplan�s keyboard work compliment the dark tones of the evening from Bob�s harmonica. The feeling reminds me of a dark night in the Delta and we�re probably lost somewhere around the intersections of Highway 61 and 49 without knowing it. Junior lends his fretwork to the mix and I really appreciate this tune a lot. �Ruckus Rhythm� starts out with a wicked acoustic bass line by Kedar Roy as the band warms its way into the mix. Bob�s harmonica is front and center here to great effect and Bob is definitely working his magic with this tune. Though fairly laidback, �Ruckus Rhythm� is again a perfect showcase for the interplay of all the performers on this track. We move onto �Harmonica Watusi� and I�m reminded of the �50s dance shows you used to see on TV. Bob is blowing some lower notes on his harmonica and the interplay between him and Fred Kaplan�s piano really does a nice job of conveying a dance feel to this tune. The title cut, �Taboo,� is up next and it manages to convey a fairly intense mideastern feel to my ears. Bob is blowing some very delicate notes on his harmonica while Todd Chuba�s percussion work in the background perfectly complements the feel I�m sure Bob was working to convey. The band heads up-tempo on �Harp Blast� and Bob is working hard on this one to keep the flow going and it�s the first tune so far that really has the harp as the lead throughout the tune. �Mr. Tate�s Advice� pays homage to one of Bob�s early mentors in the Phoenix music scene, the late Bob Tate, and Papa John DeFrancesco joins the fray on his B3 for this one. Dowell Davis is behind the drum kit for this one and his light touch on the cymbals is appreciated as Jimmie Vaughn plays a very expressive lead solo as well. �5th Position Plea� refers to 5th position playing on the harmonica and Charlie Musselwhite is a better expert than I to pontificate on this tune when he says, �Great to hear some 4th and 5th position harp playing.� What Charlie says is good enough for me and I�m enjoying Bob�s performance on this tune as well. Kid Ramos�s health issues have been well chronicled over the last 18 months and it was great to see him onstage at the BMA�s performing with the Mannish Boys and extolling the virtues of the Blues Foundation�s Hart Fund. Out next cut, �Fabuloco� is dedicated to Kid and has that upbeat Latino feel that celebrates Kid�s culture and his life. �Shuff Stuff� has that real shuffle feel to it and is a brilliantly coordinated effort by Bob, Brian Fahey on drums with a little bit of Papa John on B3 for good measure. Doug James returns on the sax as well and lends his perfect flair to the tune. Fred Kaplan�s light touch on the keyboards provides the jump feel required to get �T-Town Ramble� moving into high gear. Richard Innes is keeping the back end steady while Bob�s harp features some very expressive tone to compliment Fred�s piano stylings. Mournful, deep tones emanate from Bob�s harp as the band heads into the final cut of the disc, �Bob�s Late Hours�. The feel reminds me of the Old Bombay Bicycle Shop back in the day in Scottsdale when Francine Reed used to rule the roost. Some of the best pizza in town and a couple of very cold beers were often enjoyed as the end of the evening drew nigh, and that�s the feel I hear from Bob�s harp intonations --- the end of the evening is indeed drawing near. Taboo is probably considered a very risky project by many, me included, but kudos to Bob Corritore for pulling it off. The veteran experiences of all the players involved were seamlessly added into the mix and the result is a nice change of pace to my ears. Some great harp from Bob and stellar work from everyone else really brought his vision for Taboo into focus. The easiest place to grab a copy of Taboo is on the Delta Groove site and you can learn more about Bob at his own website. Taboo is best enjoyed late in the evening with either a glass of wine or a cold beer �but isn�t that the point? It�s the time of the night when we�re all up to no good and trouble abounds. I�m so used to seeing Terry Hanck performing at the Blues Music Awards as part of an ensemble cast of players that it dawned on me when his new disc, Gotta Bring It On Home To You, arrived in the mail that I�d never seen him play live with his band. Unfortunately for me, Terry�s based out of Florida and doesn�t get up here to Colorado that often. While I ponder my future Terry Hanck sightings, let�s give his new record out on Delta Groove a listen. It�s a disc that definitely caught my attention, for sure. Terry and the band open up with their version of an Elvin Bishop tune, �Right Now is the Hour,� and Terry�s tenor sax is at the front of the bus. Terry played with Elvin for a number of years and this is a tune that�s always stuck with him. �Baby, give love one more chance, I know you would if you could�life is getting shorter�better get it while the getting is good�right now�right now baby.� Terry continues his impassioned plea for love with a blistering guitar intro from Johnny �Cat� Soubrand on �Whole Lotta Lovin.� �So good looking baby, honey you fill up from the ground�every time I see you darling�you know my love come tumbling down.� This woman definitely has Terry�s eye and he�s pursuing her with a vengeance. Up next is an up tempo number with a Latin feel, �Pins and Needles.� Terry finds himself tiptoeing around this beautiful woman and he�s not sure what to do next. �Walking on pins and needles�watching everything I do�walking on pins and needles�honey, I�m so scared of you.� Kid Anderson is lending some tasty guitar licks to this tune and I�m not convinced that Terry�s going to be able to close the deal this time around. Soulful notes from Terry�s sax lend its flavors to his next tune as Terry tells us about his �Peace of Mind.� �Been, all over the world�you know I had my fling�without a little piece of mind, people�it just don�t mean a thing�you know I finally found me�a little piece of mind.� Terry�s priorities are in order while Cat�s back on the guitar lead and his fretwork is just killing it on this tune. �T�s Groove�, an instrumental, is a tune Terry wrote back in the �90s and decided it was time to dust it off. Anyone listening to the tune will quickly understand why Terry has won the Blues Music Award for horn as he just amazes me with the passionate feel he�s able to convey on his tenor sax. Throw in a taste of organ from Lorenzo Farrell and it�s easy to see why this tune came down off the shelf. �My Last Teardrop� is another tune that came down off the shelf and I love the doo-wop feel of this song. �You�ve taken everything from now, baby�and you turned my heart to steel�I�ve cried my last teardrop for you.� Good for you Terry. Our next cut, a remake of the Ronnie Milsap tune �No Getting� Over Me,� is a curious choice but I find that Terry and the band more than do it justice. While his sweet sax definitely conveys the sentiment of Ronnie�s song, I�m surprised to see that Kid Anderson is playing organ on the tune with Bob Welsh covering the guitar licks. Very interesting indeed. �Jam Up�, a Tommy Ridgley tune is up next and Doug James brings his baritone sax to the mix while Bob Welsh�s keyboard work on the ivories is outstanding. I particularly love the dueling saxophones in this track and it�s great to just sit back and let the band roll on another great instrumental. I was fortunate enough to meet Terry�s lovely wife Vera in Memphis this time around, and our next track, �Gotta Bring It On Home to You,� is a tune that Terry wrote especially for her. Debbie Davies sits in on guitar and vocals. �But I know where I�m going�.cause I know where I�ve been�I know our love will see me through�still my heart is aching�cause I know you�re back there waiting�gotta bring it on home to you.� Being the wife of a touring road musician is tough at times and I appreciate the love Terry conveys for Vera in this tune. Another blistering guitar intro from Cat and Terry�s wailing tones lead us to the last tune on the record, �One Horse Town.� A tune by Bobby �Blue� Bland, Terry and the band have been playing it live for the last 12 years in their road show and I�m glad that Terry decided to get it down on disc for all of us to hear. �I�m going to send you back, yea�to that one horse town�too many bright lights�you�re just pulling me down�you�re going back to that one horse town�back where you belong.� Sounds like this is one woman who has definitely worn out her welcome. Terry and Kid Anderson produced this record and it cooks from beginning to end. Terry�s been a bandleader for over 25 years now and his core band of Cat Soubrand on guitar, Tim Wagner on bass and Butch Cousins on drums have his back covered in fine fashion. Throw in a wealth of special guests and the playing on this record is outstanding. Look for Terry on the road with his band and grab a copy of this disc from him on his website, www.terryhanck.net. You�ll be glad you did. In the meantime, I�m going to hit play and start the party over. Giles Corey�s blues credentials are obvious. Since the tender age of 18, he�s played with a host of Windy City bands, including Scotty and the Rib Tips, the Chi-Town Hustlers, Syl Johnson, Billy Branch and the Sons of Blues, Otis Rush, and Mississippi Heat. Since 2001, Corey, drummer Rick King, and keyboardist Marty Sammon have also played in the rock/funk/blues/jamband Lubriphonic, which proves that the guitarist/singer/songwriter is not limited to being impressive in just one genre. The trio has joined forces with bass player Joewaun Scott to form Giles Corey�s Stoned Soul, which is also the title of their debut release on Delmark Records, an inspired set of modern blues. Each of the 13 tracks presented here, ten originals and three covers, mix the blues with rock, soul, and R&B, and should prove to be one of the most unique, and entertaining releases you�ve heard in a while. The opening track, �Oh, Mademoiselle,� is a funky blues rocker with a definite Southern Rock vibe behind it, and �Morning Train� is a boogie rocker punctuated by Pat Otto�s mandola (which is featured on several other tracks, too). On a marvelous cover of �Don�t Let The Green Grass Fool You,� Corey and his backup singers (Diane Madison, Mae Koen, Nanette Frank) blur the line between soul and gospel. �Time Flies When You�re Drunk� is a relatively laid-back track with Otto guesting again on mandola, that features some clever wordplay from Corey. The loose-limbed funky rocker �Pork & Beans� is a wild, relentless ride, and is followed by a subtle reworking of Gary Clark, Jr.�s �Bright Lights� that is as effective as the original. �Rita,� another funk-fueled rocker, allows Corey to showcase his slide guitar skills, and �Right On!� has a jazzy, lilting rhythm that reminds me a lot of early Santana with the harmony vocals, and positive message, effectively delivered by King. The easygoing �It�s All Been Said Before� has a country feel, and �Watch Myself Go Crazy,� sung by Sammon, is reminiscent of the jazz/R&B/pop music of the �70s. As impressive as Corey�s fretwork is, I�m even more impressed with his vocal talents. He covers a wide range of styles here, and doesn�t sound out of place with any of them. Sammon, who played keyboards for years with Buddy Guy, is the secret weapon of this disc, and the Scott/King rhythm section is standout from beginning to end. 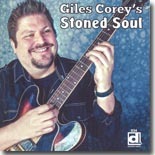 Blues fans young and old are strongly encouraged to check out Giles Corey�s Stoned Soul. You�ll find yourself coming back to it again and again. This is proof positive that the future of the blues is in good hands. Blues and rock fans owe an overwhelming debt to John Mayall, not only for his 50-plus years as a performer, but also for serving as mentor for to scores of rockers such as Eric Clapton, Peter Green, Mick Taylor, John McVie, Mick Fleetwood, Jack Bruce, and numerous others. At 80 years of age, Mayall is still a formidable talent in his own right, recently issuing A Special Life (Forty Below Records), his first studio effort in five years. Mayall and his excellent band (guitarist Rocky Athas, bassist Greg Rzab, and drummer Jay Davenport) have been together since his previous studio album, 2009�s Tough, and the five years of performing together have paid off, judging by their sparkling interplay here. A Special Life consists of 11 tracks, six covers and five originals, that focus primarily on traditional blues and blues themes. The original compositions range from the topical �World Gone Crazy� to the autobiographical title track to the wistful �Just A Memory.� Rzab and Athas contribute the rugged �Like A Fool.� Mayall also reworks �Heartache,� a track that originally appeared on his debut album in 1965. 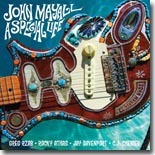 Produced by Eric Corne (Walter Trout), A Special Life is an ideal John Mayall disc. It serves as a very nice introduction for new listeners and should be must-listening for his many fans. Albert Castiglia has developed into one of the blues most consistent performers over the past couple of decades. The former Junior Wells sideman has released six albums over the past ten years, each one improving upon its predecessor. Castiglia�s latest release, Solid Ground, is his first for Ruf Records, and it sets the bar pretty high for future releases from the dynamic guitarist, with a 14-song mix of impressive originals and well-done covers. Highlights include the solid opening track, �Triflin�,� a fine showcase for Castiglia�s fretwork and soulful vocals, �Keep You Around Too Long� which has a loping Texas swing, and Castiglia duels with fellow guitarist Dave Gross, �Have You No Shame,� a devastating slow blues, and �Put Some Stank On It,� which features some great interplay between Castiglia and singer/guitarist Debbie Davies. �Love One Another� is an enthusiastic pop/rock number that calls for all the nations to settle down and get along before it�s too late. Castiglia really shines on �Sleepless Nights,� a slow blues burner with some really intense guitar work. The old St. Louis Jimmy classic, �Going Down Slow,� gets transformed into a funky mid-tempo rocker driven by some exquisite keyboards from Jeremy Baum and a fierce guitar solo from Castiglia. �Hard Time� is an acoustic country-flavored track, and �Celebration� has a real Americana feel. There�s no question that Solid Ground is Albert Castiglia�s best release to date, with some of his best songwriting to date, powerful and versatile vocals, and dazzling guitar work. There�s a lot to enjoy on this new release for blues and blues-rock fans. Beginning in the mid 1990�s, the Asylum Street Spankers built a large following with their eclectic brand of roots music that blended traditional sounds of blues, country, jazz, and swing with thoroughly modern, occasionally counter-culture themes. They covered a wide-range of territory over their 17 years together, ranging from recording a children�s album in 2007 and an �agnostic gospel� release in 2009. The band decided to call it quits in 2011 and their final performance consisted of a three-day series of performances in Austin, Texas, the band�s hometown. For the record, though the line-up changed throughout their history, the final set of Spankers consisted of Marrs (lead and harmony vocals, guitar, tenor guitar, tenor banjo, ukulele, musical saw, percussion), Newman (resonator and acoustic guitar, harmony vocals, lead vocals, mandolin), King (mandolin, dobro, banjo, harmonica, harmony vocals, lead vocals), Morgan Patrick Thompson (string bass), Mark Henne (drums and percussion), Shawn Dean (violin, fiddle), and Trevor Smith (banjo, mandolin, guitar, harmony vocals). A couple of tracks feature tuba from Will Landon, harmony vocals from founding member Wammo, harmonica from Guy Forsyth, and clarinet from Stanley Smith. 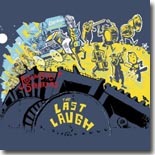 Three years after their demise, The Last Laugh will be a pleasant surprise for the Asylum Street Spankers� many fans. It also serves as a nice introduction to the band�s music. Fortunately, Yellow Dog Records has kept their catalog in circulation, so after new fans start listening here, they can go back and hear what they missed. This is essential listening for fans of American roots music. 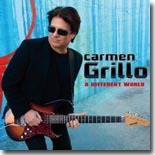 Guitarist Carmen Grillo has been an in-demand session guitarist for over 30 years, performing and recording with the likes of David Foster, Smokey Robinson, Donna Summer, Huey Lewis, Boz Scaggs, the Four Tops, and Rita Coolidge, who he also toured and recorded with during the early to mid-�80s. He also worked with the legendary band, Tower of Power, for nearly ten years as songwriter, singer, and guitarist. Since the late �90s, Grillo has owned his own recording studio, serving as producer and engineer. In his spare time, he still performs as part of The Sons of Champlin and The Max Weinberg Band. He also has managed to find time to release a new CD, A Different World (Big Surprise Music), which shows that all those years of playing behind such a variety of artists allowed him to develop a pretty impressive, wide-ranging set of skills. Grillo covers a lot of ground on A Different World�s 12 tracks. Multiple tracks, such as the swinging opener, �Come and Gone,� the jazzy �Tryin� To Make It Happen,� the topical title track, the Crescent City-styled �The Nature of the Beast,� and a funky cover of Johnny �Guitar� Watson�s �A Real Mother For Ya,� recall the glory days of Tower of Power with punchy horn charts. On tracks like the ballad, �Sad State of Affairs,� the Texas shuffle �Everything�s Gonna Be Alright,� and the soulful acoustic closer, �You�re The One,� Grillo shows that he knows his way around the blues as well, bringing to mind the work of Robben Ford with his vocals as well as on guitar. There�s also plenty of great guitar as well, as Grillo includes four choice instrumentals as well, all of which are worth the price of admission on their own. �I Got The Sauce� is a slice of Memphis-styled blues with Grillo�s stellar fretwork backed by some greasy keyboards from Rob Mullins and Ruben Valtierra. �Prototype� is a jazz/blues track with Grillo being joined by Tom Scott on tenor sax, while �Transatlantic Boogie� is an electrifying funk workout, and the aptly-titled �River of Molten Rock� keeps the funk going along with some piercing string-bending from Grillo. If you liked the old-school R&B-based rock and soul of Tower of Power back in the day, then you will absolutely love this disc. Carmen Grillo shows that there�s still a lot of great music left to be heard in that genre, but he also shows that he�s more than capable of playing the blues as well. Blues fans will definitely appreciate his fearless guitar work as well. 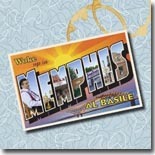 Former Roomful of Blues member Al Basile is celebrating 15 years on his Sweetspot Records with his tenth solo release, Woke Up In Memphis. As the title indicates, the singer/songwriter/cornetist takes his inspiration on these 14 new original compositions from the music of the Bluff City: blues, soul, R&B, and gospel. As on previous releases, Basile is joined by guitarist/former Roomful bandmate Duke Robillard (who also served as producer), drummer Mark Teixeira, keyboardist Bruce Bears, bass player Brad Hallen, and a powerhouse horn section that includes Basile, Rich Lataille (tenor sax), and Doug James (baritone sax). The band really has the feel of the Memphis sound on these tracks, particularly the horns, who really recapture that classic Stax/Hi Records sound, and Bears� keyboards pack the appropriate amount of Memphis grease. Basile�s songwriting, as always, is top notch, with lyrics about everyday feelings and events that make his songs relevant to most listeners. Standouts include �Don�t Make Me Beg,� �One More Stone In The Pitcher,� the upbeat title track (which has an almost gospel vibe), and �Jimmy and Johnny,� a poignant ballad. Basile�s warm vocals are a great fit with this material and he�s as comfortable on the soul and R&B tracks as he is on the straight blues numbers. Each of his albums finds him trying new things and moving in different musical directions, absorbing the influences from his previous releases each time. This approach makes for some interesting and compelling listening. In my opinion, Woke Up In Memphis stands as his best release yet, and I eagerly await his next musical venture. 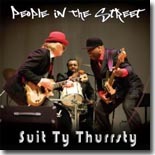 Suit Ty Thurrsty is an eclectic NYC/Connecticut-based band that fuses the blues with rock, funk, soul, and hip-hop. Consisting of Tom �The Suit� Forst (vocals, guitar, guitar synthesizer), Tyree �TY� Pope (vocals, bass), and Pedro �Bigg Thurrsty� Johnson (vocals, drums), the trio puts their genre-busting approach , along with in a bit of social commentary on the side, on full display with their new release, People In The Street. Whether it�s R&B like the opening track (�I�m Never Gonna Leave You�), the funky �You Make Me Real,� and the moody ballad �Mama (What�s A Man? ),� or searing blues-rock like �Same Old Song,� �Darkest Before Dawn,� and �Drawers,� or modern-styled hip-hop-flavored blues like �I Got The Blues� and �I See Your Blues,� or even scathing scorched-earth , take-no-prisoners takes on social topics like �Diamonds� and �I�m Already Against The Next War,� there�s plenty for fans of multiple genres to appreciate. This trio means business, crossing over and blending the various musical styles with ease. Each member takes several turns behind the mic and all are strong vocalists. Forst plays some fierce guitar and Pope and Johnson are a powerhouse rhythm section. The songwriting is superlative as well. People In The Street offers something for everybody who calls themselves a music fan�..great original tunes, excellent musicianship and performances. You�ll be hearing more from these guys. 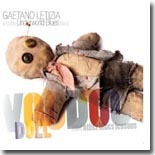 Gaetano Letizia & the Underworld Blues Band mix the blues with jazz and funk in equal doses. Guitarist Letizia is based in the Cleveland area and has been playing guitar since the age of 15, studying the music of B.B. King, Eric Clapton, and Jimi Hendrix, but also learning from jazz guitarists like George Benson and Pat Marino as well. Voodoo Doll & Other Blues Lessons is his ninth CD and it�s not a stretch to hear the influence of these guitarists at different times on the disc�s 12 tracks. On tracks like �The Devil Is A Nice Guy,� where he takes on politicians and the like, �Sold My Soul,� �Bleed,� with its vivid imagery, and the jazzy closer, �Big Secret,� which takes on critics of his hometown, Letizia is not afraid to step on toes or ruffle feathers. Not all is heavy, however, as he ably handles the acoustic flamenco track, �All I Need,� the upbeat �Blow The Blues Away,� and the lovely instrumental, �Orange Sunglasses,� with aplomb. Voodoo Doll & Other Blues Lessons is an outstanding release, mixing blues with elements of jazz and funk, some first-rate songwriting and performances, and deserves to be heard. The Blues is a genre over saturated by the footsteps of the gods. SRV, Eric Clapton, Muddy Waters, B.B King, Robert Johnson. This is just to name a few. It's a dark, soulful genre that cannot be imitated but lived. You can hear that through the Tomas Doncker Band as these romp and roll through ten tracks of soulful blues hysteria in dedication to one of these legends, Howlin� Wolf, whose low end, croaked out voice is one that resonates in the heart of the blues world. A tribute to one of the greats is one that cannot be taken lightly or done with a lack of style or purpose. 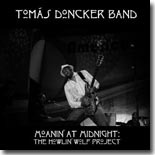 Tomas Doncker, head of True Groove records, does this with a immense amount of both and humble worship on Moanin' at Midnight: The Howlin' Wolf Project. The opening track, �Evil,� brings the listener directly into Howlin' Wolf's world with an upbeat pompous take on the stripped down piano and harmonica classic. The harmonica is still heavily incorporated but spaced out guitars, burning solos and a punchy drum beat have been added. A truly psychedelic trip into the Wolf�s world. Another classic redone is �Back Door Man,� taken from his first electric album. A gritty, stripped down effort, one guitar clean and reverb heavy, straining to stay on the neck through the Wolf�s abuse, the other slightly distorted and used to make a repetitive circular run through the blues scale. A bluesy psychedelic masquerade. Doncker�s take with this one is on point, with an added levels of volume and keys. However, the same tones can be found and his low end vocals match The Wolf�s nearly perfectly. A modern take on a blues classic done perfectly. The popular �Smokestack Lighting� is taken on with expertise and ease. A much heavier, more psychedelic version is produced by Doncker and crew. Making heavy use of fuzz and powerful rock drumming and a nice key section featuring a quote from the Wolf himself is featured in the middle of the tune. Guitars fight back and forth as one dominates sparingly in the rhythm section, while the other carries the melody in a most fuzzed out manner. Doncker soulfully strains out a �Why don�t you hear me crying / Ooooooohhooooo,� nearly rivaling Wolf himself. Tributes to classics can be a complicated matter. When multiple artists get together to pay tribute is one matter, but it is a monster within its own when one artist does it. Tomas Doncker puts a heavy twist on an already heavy man and does so with style and soul. 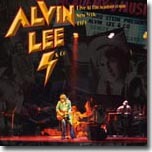 This review of Alvin Lee & Co's Live From The Academy of Music album is unique because Lee is the first musician to feature on the innovative, subscription-based Digital White Label platform launched in May. Over a 12-month period, a previously unreleased collection of audio tracks is downloaded, alongside a variety of other exclusive material accessible on-line, all for the price of a single CD. The first two songs already released from this live gig are "Let�s Get Back" and "Got To Keep Moving." Whilst they are both from Alvin�s live In Flight double album of 1974, they are very different in this new format. This is because these are extended, live performances from what was clearly a memorable night in New York, and the fact that the bass and keyboard players for this 1974-75 world tour were the sensational Steve Thompson and Ronnie Leahy, respectively. Neither artist featured on In Flight, but who can forget Steve�s thumping, mesmeric riff on John Mayall�s classic blues/jazz number, California? Leahy, of course, found fame with Stone The Crows and Jack Bruce. The band also includes iconic former King Crimson members Mel Collins on flute and saxophone and the late Ian Wallace behind the drums. Thompson and Wallace are in perfect rhythmic synergy on both tracks whilst "Let�s Get Back" highlights Leahy�s exquisite keyboard skills. Not surprisingly, in the 15 minutes of music so far, Alvin�s powerful vocals and trademark blistering, inventive and incisive guitar solos steal the show. This is just the aperitif, as other tracks to be released include "Time And Space" and "There�s A Feeling." The prospect of hearing new versions of these with Alvin and the band on fire is mouth watering. Thanks to expert mastering, mixing and executive production, the original tapes are transformed into a crystal clear, high quality recording which is superior to any live album I have heard from that period. With more of Lee�s personal drawings, newly released photographs and memoirs to come, together with the ongoing interactive blog, it is unlikely that owning a CD will ever be the same again. As one Alvin Lee fan commented: �It is like celebrating Christmas every month.� Given the outpourings of grief and universal respect for the legendary musician who passed away far too early at the peak of his creativity, this commemorative package is an important legacy.